These cracks around the rigging tube were hairlines - until water got into them, and froze. 1. Run your raw water washdown dry. Then dis-attach the hose, and make sure it’s fully-drained, too. If your boat lives in the water, that means shutting off the seacock and removing the intake hose, first. 2. Empty both waste and water tanks. If you’re in an area that sees “hard” freezes that last several days, you’ll also want to run antifreeze through these systems. Make sure you use the pink stuff (non-toxic propylene glycol). 3. Tilt your outboard down–whether the boat’s in the water or kept on dry land. Either way, the cooling passages won’t fully drain when tilted up. And the prop hub can catch rainwater in the up position. Remember: this is all you have to do, and running antifreeze through an outboard is just a waste of antifreeze, because it will all drain right back out of the cooling system anyway. Any boatyard that tells you different is misinformed or just looking for ways to boost their bill. 4. Winterize stern-drive or inboards. This can be a bit more involved (depending on the specific boat and powerplant). Truth be told a handy boater can find out the specific process pretty easily with a little help from Google and YouTube, but if you have your doubts, in this case it’s better to take the boat to a pro. 5. Run livewell pumps, fishbox macerators, and any other pumps that may be holding water, until you’re positive they’re dry. 6. If your boat is stored on a trailer, remove the drain plug. You should have done this, anyway, so rainwater can drain out of the boat. But if you didn’t and then water in the bilge freezes… ouch. 7. Check all scuppers, ports, and drains, and make sure they aren’t clogged so water can drain freely away. Water, whether it’s from rain, the lake, or the bay, is your main enemy when it comes to potential freeze damage. 8. Remove all bottled water from your coolers. This may sound like a silly one, but I learned it first-hand. I always left bottled water in my boat’s cooler, and one winter a bottle burst when it froze. The next day it thawed, and water covered the bottom of the cooler. Then it froze and thawed repeatedly for the next few days and nights. The next time I opened the cooler, little cracks ran along the edges of the bottom. By the end of the next season the cracks had become chasms. 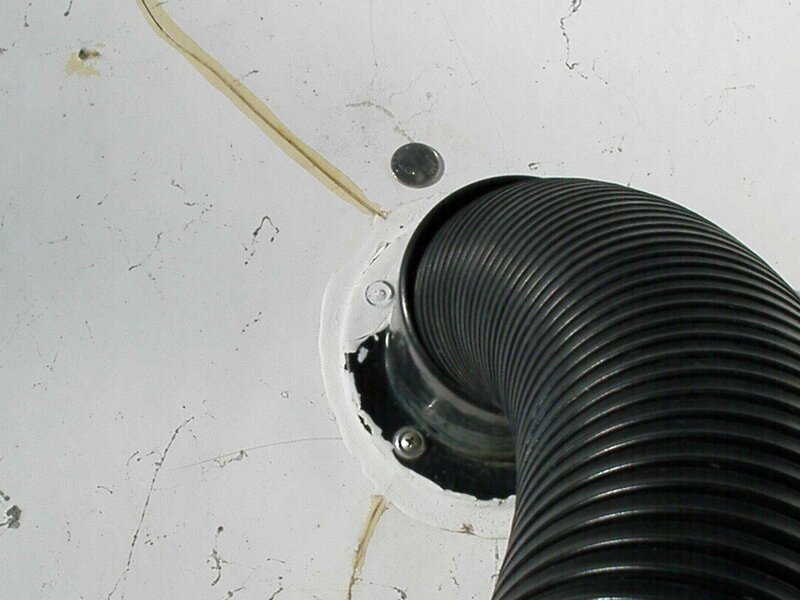 These cracks around the rigging tube were hairlines – until water got into them, and froze.